The Lake’s Apprentice by Annamaria Weldon UWAP 2014. “This kind of writing – the fruit of real contemplation, informed by a wide range of ideas, respectful of the reader’s intellect and imagination, driven by an empirical sensibility – is, for me, where the best ‘nature writing’ is to be found”. There is a savage passion which can invade the urban hominid when they encounter and, more significantly, engage with nature. Yet Nature is often so wild and foreign to our experience that it is almost impossible to ‘see’, let alone interpret. We could spend many days or months learning the seasons, the landscape and the inhabitants. To engage with the land and find our part in it – often through photography, conversation or writing – of necessity takes time, persistence and eventually, love. Inevitably, most of us have neither the time nor skill to devote to understanding a landscape, an ecosystem, the way of lives. Therefore, to find an author who has devoted five years to one special place – ‘an ecology of residence’ – and collected their observations and engagement, photos and reveries into a work that fits in your back pocket and can amplify an hour’s visit, is extraordinary. This is what my friend Annamaria Weldon has delivered with the recently published The Lake’s Apprentice, a story of gradual attunement to the wetlands of the Yalgorup National Park and the Lake Clifton thrombolites. The launch, attended by around 100 people, was held within UWA Publications’ late-Victorian premises on the Claremont campus. It was opened by Annamaria’s mentor and cultural guide George Walley, who provided the acknowledgement of country on behalf of the traditional owners. He then went on to describe their meeting, and later immersion in Bilya Maadjit, the Bindjareb people’s name for the Murray River, a significant flow in the Peel-Harvey catchment leading into Yalgorup. It is considered by Bindjareb Noongar the umbilical cord of Mother Earth. Immersed in Bilya Maadjit George introduced Annamaria to country, a welcome to move freely through the land with humility. Lucy Dougan spoke next, elaborating the personal significance Yalgorup has for Annamaria, who came from Malta in 1984; Yalgorup has become her portal for ‘home, place and belonging,’ enabling her to ‘make a reckoning with past and present.’ Dougan went on to discuss method: an artist usually presents only the finished artifact, yet in The Lake’s Apprentice there is evidence of the ‘footslog’ of work over time. To publish both the finished art and the journey is compelling. Landscape is an archive, a book that not everyone can read, however Annamaria has brought to life an Atlas, a set of maps, stitching experience and place together. And she has taken time to contemplate personal loss of culture, ritual and access to knowledge, finding a way through to a new way of seeing. With gratitude to Annamaria for coming to us from Malta, Lucy formally launched The Lake’s Apprentice. In acknowledgement, Annamaria spoke of her flight from Malta and growing attachment to country, first Denmark via love broken, then loving again – the lakes of Yalgorup. The finished work of some 260 pages contains 242 colour photographs and decorative illustrations by Carolyn Marks. It is organised into two parts: the first a set of four nature notes and accompanying essays; the second a body of 38 poems. 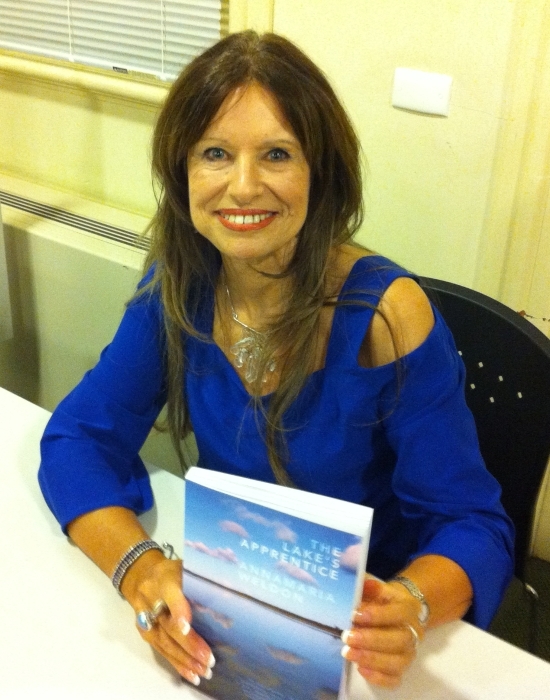 Annamaria paid tribute to the many relationships developed in realising her work, gleaning information from scientists, the community, traditional owners and, ultimately, the publishing team at UWAP she trusted to ‘house-sit my dream.’ Now Annamaria has another dream, that The Lake’s Apprentice reaches out to our children’s children so that, wherever we come from, we all come home together in loving the land. Alex R Chapman was born in Sydney but has lived in Perth since 1988 working as a botanist. He first started writing songs and performing while at the University of New England and has been playing music in various bands ever since. Sojourn, his first collection of poetry was published in 2013. This entry was posted in Alex Chapman, Annamaria Weldon, Issue 11, The Lake’s Apprentice, UWA Publishing and tagged Alex Chapman, Annamaria Weldon, Australian Literature, Australian poetry, poetry by Mark Roberts. Bookmark the permalink.